Don’t let scratches and spills limit you from using your new computer tablet! Protect your valuable electronics with our new Ultra Sleeves™ disposable, protective sleeves for computers tablet and e-readers such as iPads and Kindles. 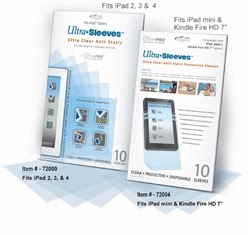 Ultra Sleeves™ are designed to be economical solutions for using your computer tablet at the beach, with your kids, in the kitchen, at a barbeque… or whenever you want to protect against that OOPS situation! The sleeves are made from the same high quality, acid-free, and recyclable plastic film used in the collectibles industry, with added anti-static feature to better protect your expensive electronics. The sleeve closes with double adhesive strips. This allows it to be secure on your iPad but also allows you access to charge it and adjust and reseal. I used the iPad sleeve for my Kindle 7 as I had read they had them for that size as well. I received the iPad sized sleeve for review but wanted to see how they worked for my kindle as well. I simply folded it down to fit. It still snapped into my kindle case without a problem. I was worried that the touch screen would be hard to use, that it wouldn't feel the touch. That was an unfounded worry! I didn't have any trouble flipping through my books lists, playing games, or typing up emails. It gave me a nice clear protection for the kindle. This is great for when I use it for working in the kitchen on recipes. I often have my son use it while he makes desserts and it makes me feel so much safer with a ultra sleeve on it.